Easily one of our most popular spectator activities in recent years, the Koni Power Wheels Downhill Attack by Red Line Oil is your chance to show your kids what their toy is made of. Come experience the legendary "Roller Coaster" section of the 3.27-Mile Full Course at VIRginia International Raceway during this year's HyperFEST presented by Grassroots Motorsports. All you need to compete is a Power Wheel, a helmet, and your skill (..err maybe more like courage). Participation is free and in addition to bragging rights for a year, you also have a chance to win $100 and one full year of glory and bragging rights. Basically, all you need is a Power Wheel or similar vehicle with the battery and motor removed. For more information, reread the rules post above. Yes, you must have a helmet to participate in the Power Wheels Downhill Attack. How Many OTHER VEHICLES are on track in a race? It depends on the number of entrants, however we generally run about 8-10 vehicles per heat. Yes, it has been known to happen (see pics above), however no one has been seriously injured. 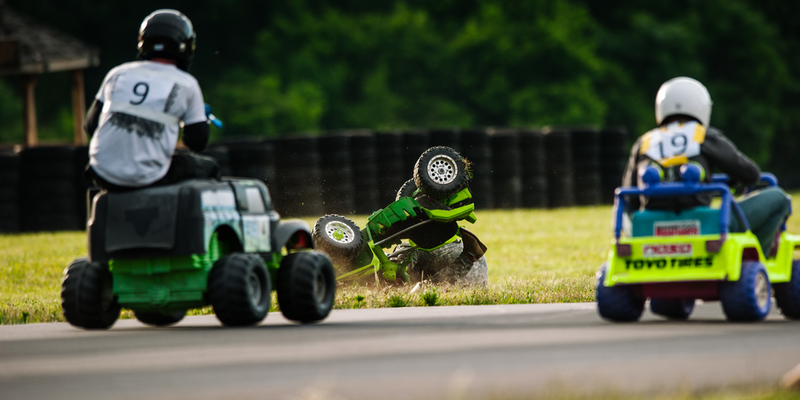 Usually participants just spin out or drive off the track and land in the grass. However, we do ask that everyone exhibit sportsmanlike conduct and not directly wreck or cause someone else to crash on purpose.